To continue supporting our local community, we rely on the generosity of individuals and businesses for support. We provide training and lots of support to all our volunteers. Join a fantastic team, making a difference every day. We will soon be changing our service. We will announce the date in advance. At that point you will be able tocall into our reception anytime from 9:00am-4:00pm. We will direct you to the most appropriate advice channel Until further notice, our drop in will continue on a first come first serve basis. Coventry Citizens Advice is here to make society fairer. We do that one person at a time, helping people solve their individual problems and build resilience for the future. Last year we supported over 20,000 people online, over the phone and face to face providing free, impartial, independent and confidential advice. We are one of the few remaining agencies with an "Open Door" service in the city Centre. 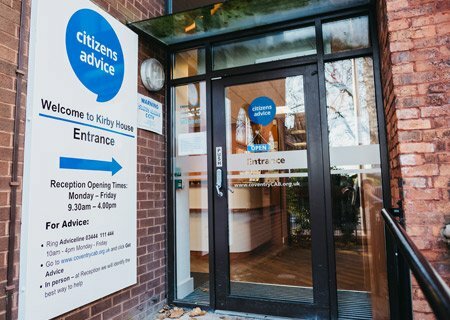 Out of 22 national charities, the Citizens Advice service is ranked by the general public as being the most helpful, approachable, professional, informative, effective/cost effective, reputable and accountable. Funding is reducing, whilst the demand for our services is increasing and we need your help to continue supporting the people of Coventry. Every £1 invested generates £11 benefit to the client. Find out about supporting our work below. I have gained financially from your help in reducing the cost of my water bill, & I am grateful for the advice I have been given about the help I can access in the future. Volunteering increased my life chances and provides opportunities to enable me to make a difference and change lives.